It’s been a while since I’ve done a Baum review, so let’s do this. The illustrator of the first Oz book was WW Denslow. If you recall, he illustrated only the very first Oz book before John Neill took over in book two and illustrated over 30 Oz books in his career. Denslow and Baum had a falling out in 1902 over royalties from the first Wizard of Oz musical. 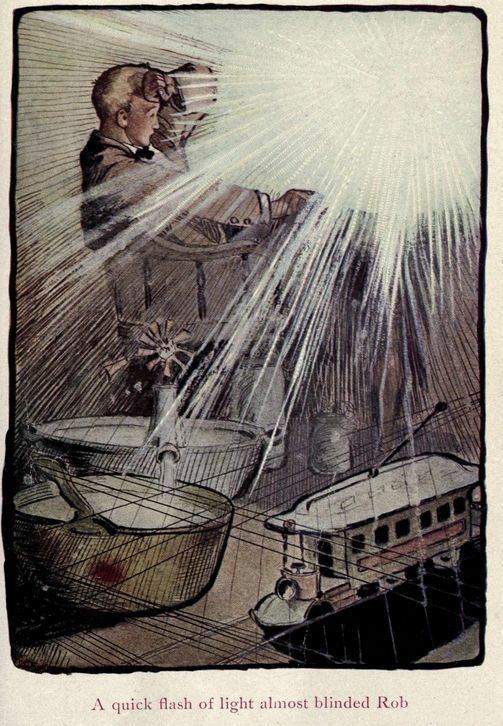 However, before that happened, Denslow had also illustrated Baum’s books By the Candelabra Glare, Father Goose: His Book and another children’s fantasy story called Dot and Tot of Merryland. Dot and Tot of Merryland was published in 1901, the very next year after The Wonderful Wizard of Oz although it was actually written around the same time. As I mentioned, the book is a children’s fantasy book written in the same style as Wizard. Child protagonists visit a magical fairy land and must find their way back home when they become trapped there. Yes, that sounds awfully familiar but it’s Baum style, it’s straight up in his wheelhouse. He managed to make this concept work for like four or five of his Oz books, so I’m not too worried he’ll make it work here. The story begins with Dot who is a bit of a sickly child. She’s sent to live in her father’s palatial mansion in the outskirts of town. While there she has the run of the estate. She starts playing with the gardener’s little boy, Tot. They are having a picnic out by the stream that runs through the back yard and they are swept away in a rowboat which takes them through a tunnel in the mountains where they emerge in a fairy land called Merryland. They meet a crazy cast of characters including a guy with long whiskers called the “Watchdog” that oversees the entrance to Merryland and they meet the ruler of the land who is a walking, talking wax doll. Dot and Tot are adopted by the queen and go with her to tour the seven valleys of Merryland. Well, it’s been a while since I did an L Frank Baum review. The last Oz book I reviewed was the first post-Baum Oz book The Royal Book of Oz (#15 in the series) back in September 2013. I then reviewed Baum’s non-Oz The Life and Adventures of Santa Claus back in December 2013. Unfortunately, now, I see I’d not done a Baum review in 2014. And that’s a shame. Really sorry about that. So I thought it was time to check out another of Baum’s non-Oz tales. There’s a short novel Baum wrote that always sounded interesting and has intrigued me ever since. So I thought I’d do that book today. In 1901, one year after Baum published the first Wizard of Oz book, he released the short novel The Master Key, An Electrical Fairy Tale. 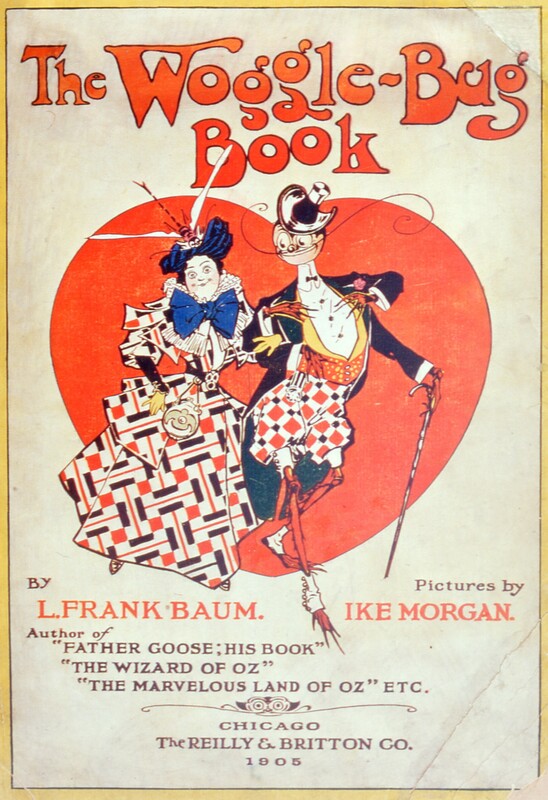 The book was illustrated by Fanny Young Cory who also illustrated Baum’s The Enchanted Island of Yew in 1903. It’s a short boy’s adventure novella with some early elements of science fiction. The story concerns a young boy, Rob Joslyn, who likes to experiment with electrical devices. He spends his time in his workshop creating electrical inventions that spread all throughout the house. One night while tinkering with his switchboard, he is assaulted by a bright light and sees a being made entirely of brilliant light appear. It’s the Demon of Electricity. Apparently, Rob has touched the “Master Key” and has earned the right to command the Demon. For this honor Rob will receive three gifts from the Demon for the next three weeks to total nine gifts. Over the next few weeks Rob takes the gifts from the Demon and has several adventures all across the globe. The gifts that Rob receives are all based on electricity and are supposed to show Rob how electricity can be harnessed in nature to do wonderous things. Rob receives a transportation device that uses electrical and magnetic energy to physically transport someone swiftly over great distances. He also receives a tin of food tablets that provide all the nutrition a human body needs for 24 hours (that is somehow based on electricity). He also receives glasses that read a person’s electrical aura to tell if they are good, evil, wise or kind and a small tube that shoots out an electrical signal that knocks a person unconscious for 1 hour. Rob uses these gifts to travel across the globe and help out people like the Kings of England and France, two shipwrecked sailors and a group of middle eastern peoples in a war with each other. It’s a fun, fanciful read. Typical Baum. Rob winds up getting into a lot of his mischief because he falls asleep at inopportune moments but he’s able to use the gifts and his own ingenuity to get out of the situations. The story reminds me a lot of Aladdin with the Demon of Electricity as the genie and Rob as Aladdin. Baum makes a few good predictions with his gifts. 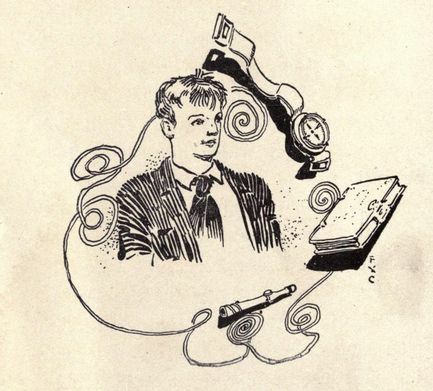 Especially considering he was writing in 1901. The electrical tube that incapacitates people for an hour is strikingly similar to a Tazer. In a later passage, Baum comes very close to describing intellectual piracy with another gift the Demon bestows on Rob. It’s a small device that can look in on any event that is happening throughout the world. At one point Rob watches a brand new play being performed and is suddenly filled with guilt because he didn’t pay to see the performance. Rob goes on to think that if these little devices become more common then people would sit at home to watch the performances and the actors would all starve to death. Very prescient if you ask me, Mr Baum. Fanny Cory’s illustrations are simple yet fit the story well. Below are two of the color illustrations. 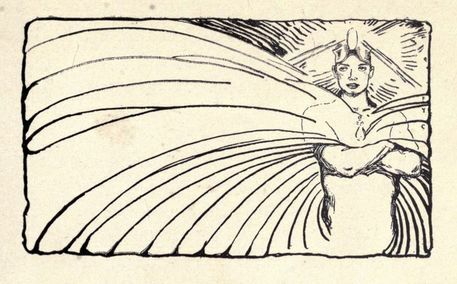 There are also numerous smaller black and white illustrations throughout the chapters. The picture on the left showcases the first time Rob uses the electrical transporter to fly away from his house in front of his family. The right picture shows Rob after encountering a tribe of cannibals on an island. Click the images to see them bigger. I love the cover to the book, it has always intrigued me. It comes from an illustration on the inside. Here’s that illustration from inside the book. It is the first time the Demon of Electricity appears to Rob in his workshop. Considering the Demon is the main thrust of the story, I’m surprised there are not really any big illustrations of him. He is only showcased a few times in some of the smaller black and white chapter drawings. Overall, yes, I can recommend this book. It has the typical Baum charm and is fun to read. Very much a journey story where the protagonist learns a lesson and essentially figures out that he was better off before the fantastical events of the book started. The book is in the public domain and can be read in its entirety here. 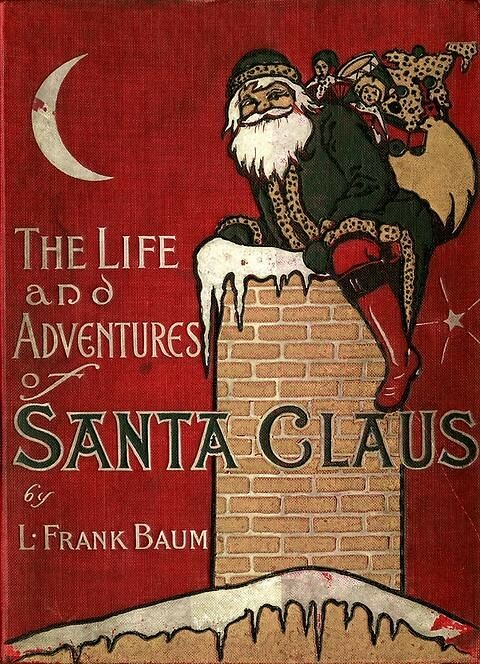 In 1902, just two years after writing The Wonderful Wizard of Oz, but 2 years before the first Oz sequel, L Frank Baum wrote The Life and Adventures of Santa Claus. 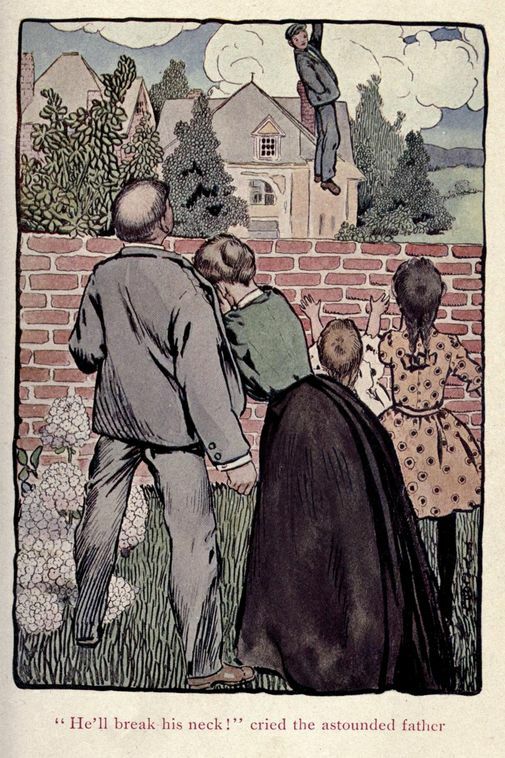 It was illustrated by Mary Cowles Clark. This was Baum’s attempt to tell the origin of Santa Claus and explain the beginnings and reasons for all of our different beliefs and practices around Christmas time. It was a very ambitious undertaking. But Baum does it in his usual dreamy, fairy tale-like manner and, for the most part, it works. Baum sets up the world by describing all the magical immortal creatures that oversee various aspects of Nature. We see creatures such as Fairies who watch over humans, Wood Nymphs who watch over forests, Gnomes who watch over the rocks and Ryls and Knooks who watch over the flowers and animals, respectively (along with many other creatures I’ll not name). All of these creatures are presided over by the Great Woodsman, Ak. One day Ak stumbles upon a lost child and allows a Wood Nymph, Necile, to adopt him. Necile names him Neclaus (Nicolas). Santa is raised by these magical, immortal creatures in the forest until Ak decided Claus must learn more about his own people and takes him on a trip into the human world. Santa is shocked and frustrated by the wars, greed, child neglect and child abuse he witnesses. Ak encourages him to not forsake the mortals as he is one of them. Santa decides to do something about what he’s seen. Santa moves to the nearby Laughing Valley where all the magical creatures help him build a workshop and get him started making toys. The idea Baum posits here is that toys don’t currently exist. Santa invents them when he makes his first toy which then transfixes the children. So he continues to do it and his operation becomes bigger and bigger as he tries to help more and more children. 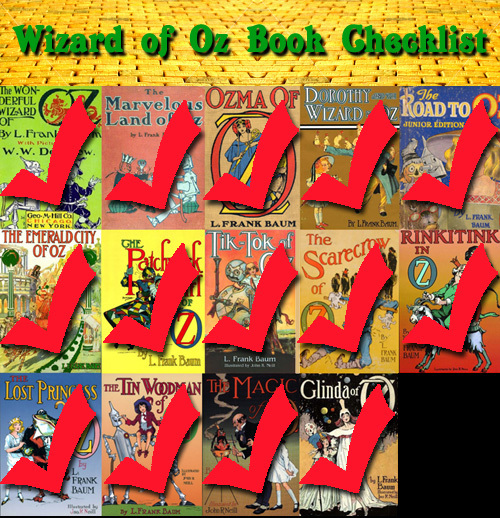 On January 31, 2012, I made a resolution to read all of the original L Frank Baum Oz books in 2012. I completed that goal on Dec 20, 2012, just under ten months later. You can visit my Oz Archive to see the reviews of all 14 of those books. It was a fun ride and I’m really glad I finally did it. I have such an affection for the original movie, which led me to read the original book and even through reading these 14 books, I have kept that love. The books were mostly good. Yes, there was some bad, but nothing was just terrible. I would have thought that by the end of this challenge I would be a little “Oz’d out” if you know what I mean. But, honestly, it’s just kindled that flame a little bit more. I think I don’t want this column to end. While I don’t plan on making another year long resolution, I do plan on reading more Oz and L Frank Baum books. After Baum, Ruth Plumly Thompson took over Oz for another 19 books. Will I read all of those? Maybe. Eventually. But not next year. There are also other movies like 1974’s Journey Back to Oz and the upcoming Oz the Great and Powerful which will be released in March 2013. I will continue to consume this media and review them under this banner. I’ll even continue to read some of Baum’s other non-Oz writings like The Sea Fairies, Dot and Tot in Merryland and Father Goose: His Book. I just have enjoyed myself so much experiencing this challenge that I want to keep it going. And I plan to. Thank you for experiencing it along with me. Stay tuned for more to come. 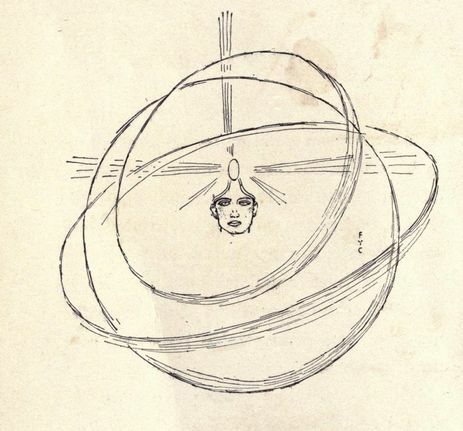 Baum wrote a short book published in 1905 right before the third Oz book; Ozma of Oz. It featured a character that was introduced in the Marvelous Land of Oz, the Woggle-Bug. It’s not an “official” Oz book, however, since L Frank Baum wrote it and it features a character from the Oz series, I’m going to include it as part of my ancillary Oz materials reviews. It was called The Woggle-Bug Book. The book takes the Woggle-Bug character out of Oz and transplants him into a nameless city in America. We aren’t told how he got there and not too many people seem distressed that a giant talking bug in a top hat is walking around the city streets in broad daylight. The bug falls in love with this crazy colored plaid dress, follows it around as it’s passed from person to person and falls in love with whomever has the dress at the time he sees them. After falling in love with a Chinaman wearing the dress as a Chinese robe, the Woggle-Bug mistakenly gets onto a balloon that carries him to Africa where he barely escapes vicious Arabs that want to kill him. He then wanders into a hidden forest with talking animals that feel more like an Oz book than the events in the rest of the book. This hidden animal kingdom is guarded by a group of bears with guns that are awesomely called a “bearicade”. The story really is weird. It’s funny and strange in some ways, but overall, it’s weird. Plus, there’s a lot of ethnic humor which, I guess, was popular at the time. However, it’s rather jarring today. This book evolved from a series of Oz comic strips called The Queer Visitors from Oz that were used to promote the second Oz book (I’m trying to get a hold of a copy of these strips for review). The strips took popular Oz characters and transplanted them into America for various adventures. Those strips were popular enough that Baum thought that formula would work again. It wasn’t completely out of left field, the Woggle-Bug had become sort of a national fad at the time. There were Woggle-Bug postcards and board games (today, he even has his own Facebook page). Also at this time, Baum was trying to mount a stage musical about the Woggle-Bug to recreate the smash hit 1902 stage version of Wizard of Oz. This book was adapted from that stage play. Unfortunately, the fad died and the Woggle-Bug play and book flopped. Now, this book is sort of a one-off curiosity. It is not considered Oz canon.